As I mentioned on Monday, Sunday the 28th September was the day I turned 27. I’m fast approaching the dreaded 3-0 birthday. As you can see from the picture below I am clinging on to my youth and my maturity level is at an all time high. 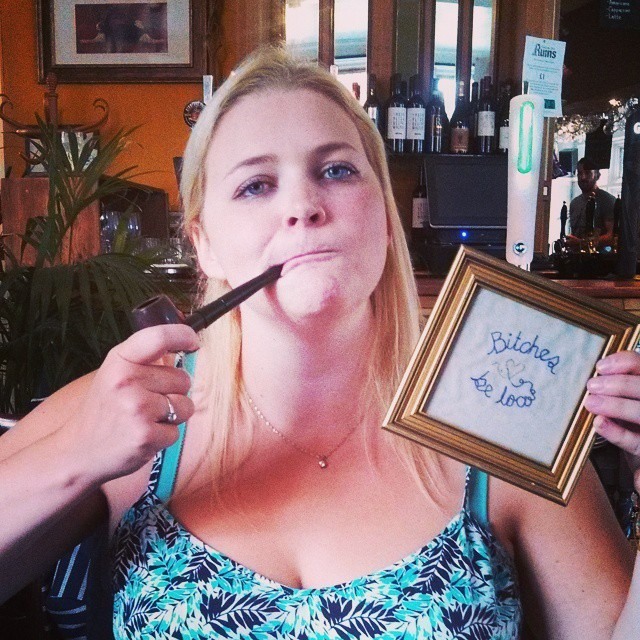 I fancied doing something different this year to celebrate with my friends. Last Christmas, me and my friends visited The Star and Dove in Bristol for their Twelfth Night Christmas feast, which was spectacular! We had our own whole roasted pig’s head! They specialise in historic recipes, using specific historical texts to base menus on. Their current dinner menu is based on William Verrall’s recipes from The White Hart Inn from 1759. With historical dining I think most people it’s going to be weird dishes using bits of animals that actually don’t taste great for the sake of shock factor. But actually there are some fantastic recipes that would be concerned to be rather modern flavours or dishes by today’s standards. Every month the team at The Star and Dove hosts a Victorian Breakfast, which I kept seeing popping up on my news feed on facebook and have been super eager to head back to The Star and Dove after our Christmas feast. That was when I realised this was exactly what I wanted to do for my birthday. The amazing team were super patient and like all their breakfasts researched a new text of the period to research recipes and create a menu inspired by the menus of that time. The menu for my birthday Victorian breakfast was based Catherine Thomson who was the wife to novelist Charles Dickens. Catherine was an accomplished hostess who published her own cookbook. Which included many recipes dinner party specialities. The menu was exciting and couldn’t wait to sample it with my friends, lucky my friends are awesome and always up for a foodie adventure so wasn’t wussy about what the food would be. 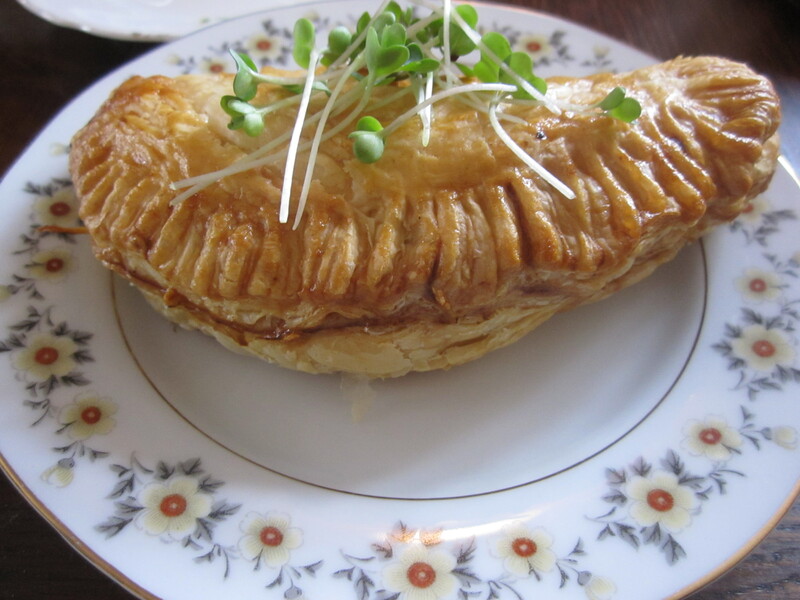 We all started with a glass of bubbles and Mushroom Patties, which would be considered like a turnover/ vol au vent/ pasty with a mushroom paté made with wine wine and mace in a buttery puff pastry. Delicious way to start the meal. On to the main courses and we all went for different dishes which meant forks were flying for everyone to try morsels of each dish. Below is the Kale-cannon, fried hertiage potatoe cake, stewed white cabbage, butter sauce. 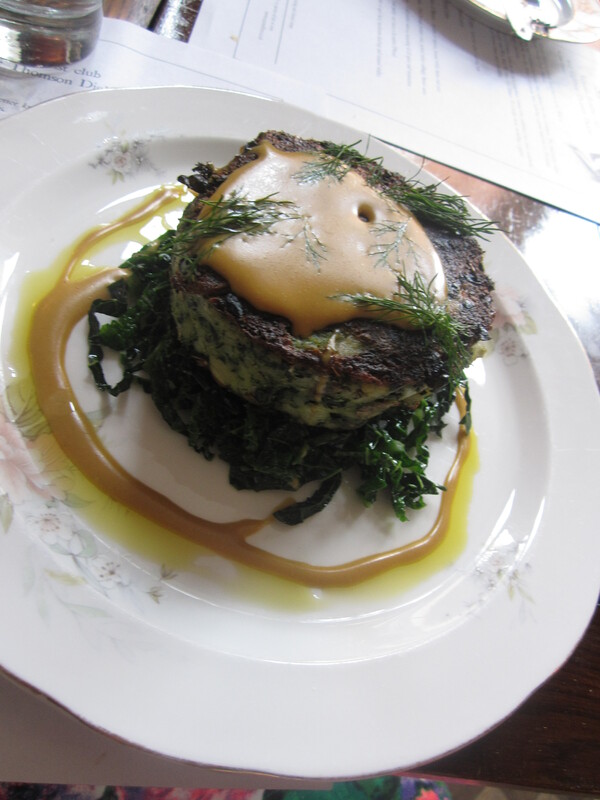 A hearty portion with the irony kale with the rich butter sauce was the flouncist bubble and squeak I’ve ever seen! I was the only one who went for this dish and all I can say is that everyone else missed out! 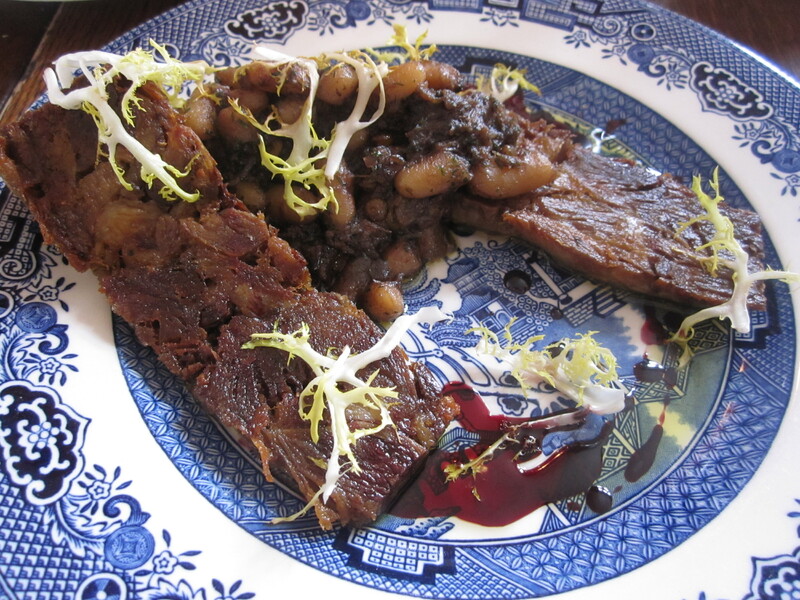 Harricot of Mutton- shoulder of mutton, dressed white beans and port. Beautifully tender mutton with still a good level of fat which I think may of been slow cooked, shredded, pressed, chilled then sliced and pan fried to get the edges crisp whilst still meltingly tender. The sweetness of the port was enough to complement the richness of the mutton. I would happily order this off the menu time and time again. A superb dish. Another very beautiful and perfectly cooked plate of food arrived in the form of the Steak A La Soyer – loin of aged beef, mushroom ketchup and roasted shallot. 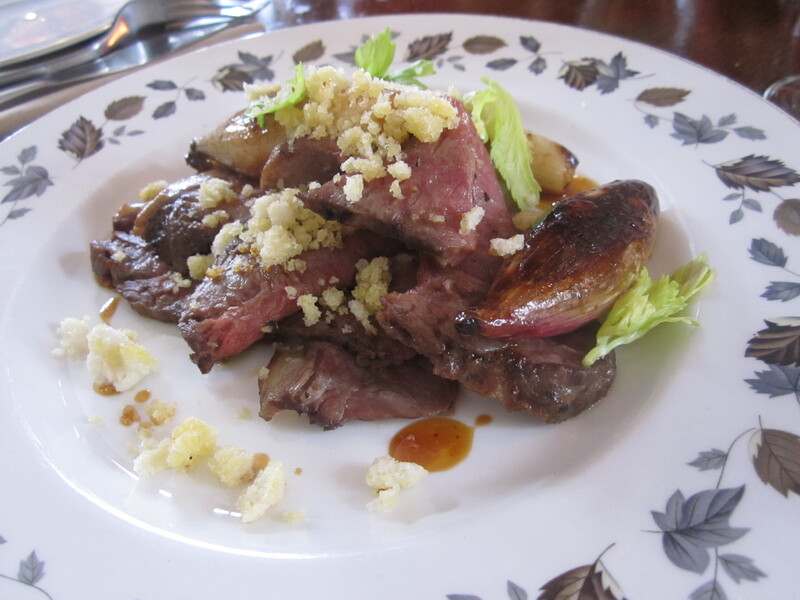 Ridiculously flavoursome beef, sweet caramelised shallots and breadcrumbs. 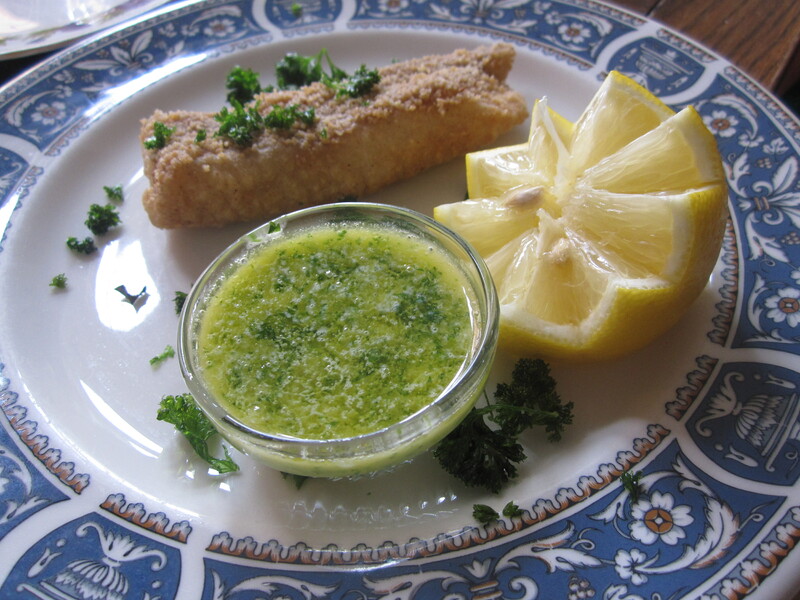 A light main course of Fillets of Plaice – fried parley and sauce a la maitre D’hotel. A Victorain Fish Finger my friend claimed! With a rich herby better sauce to go with tender fish. 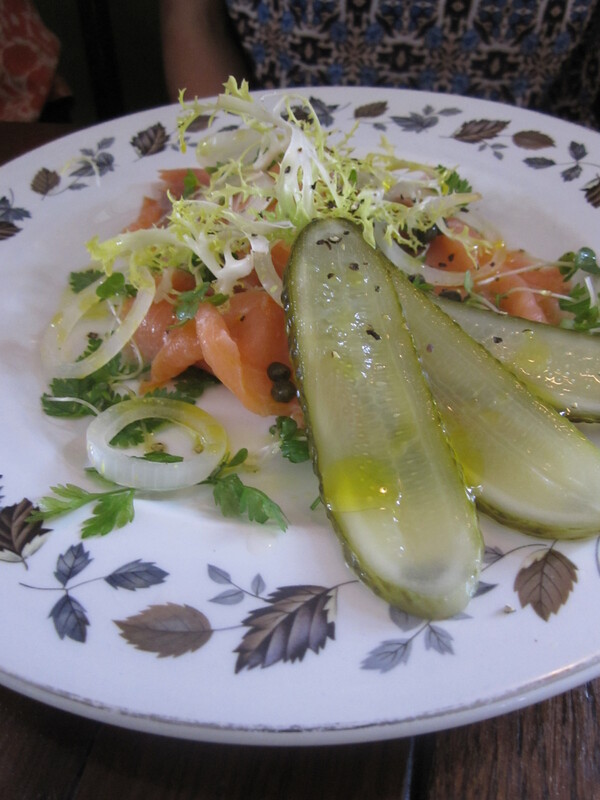 Lastly for the main courses, Em went for the Pickled Salmon- Cold pickled salmon, seasoning of all spice and watercress. The salmon had such a gentle pickle the flavour of the fish and the sea really came through rather than being masked but the stronger flavours and salts. Dessert time and my friend’s were very happy with what turned up. 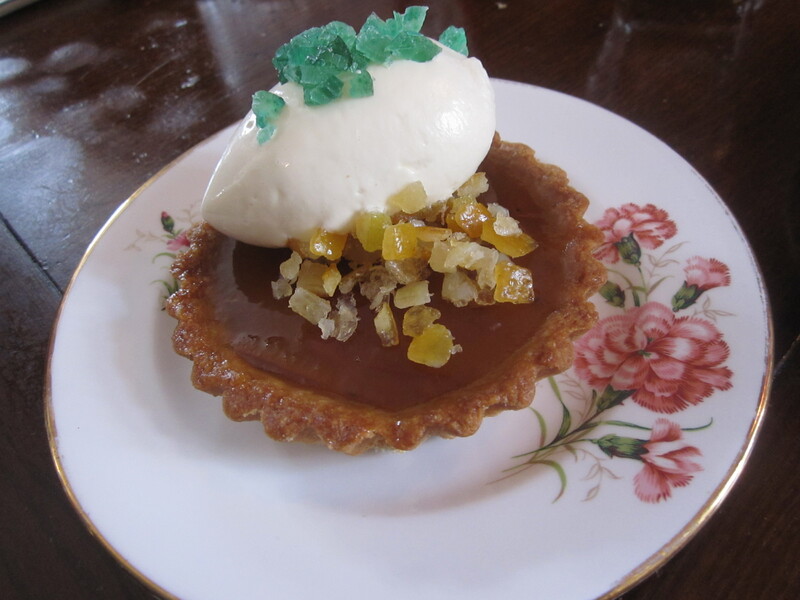 A marmalade tart with a crown of cream and candied angelica and orange peel. 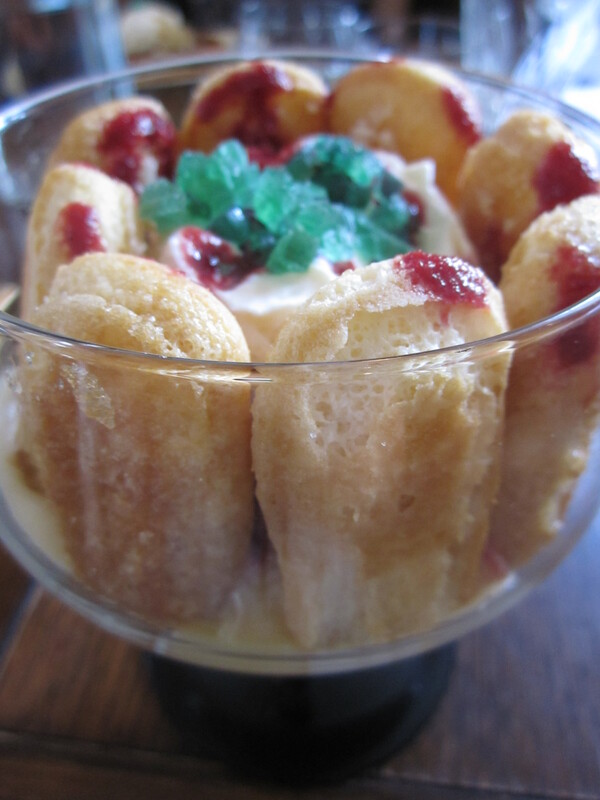 A modern looking dessert. 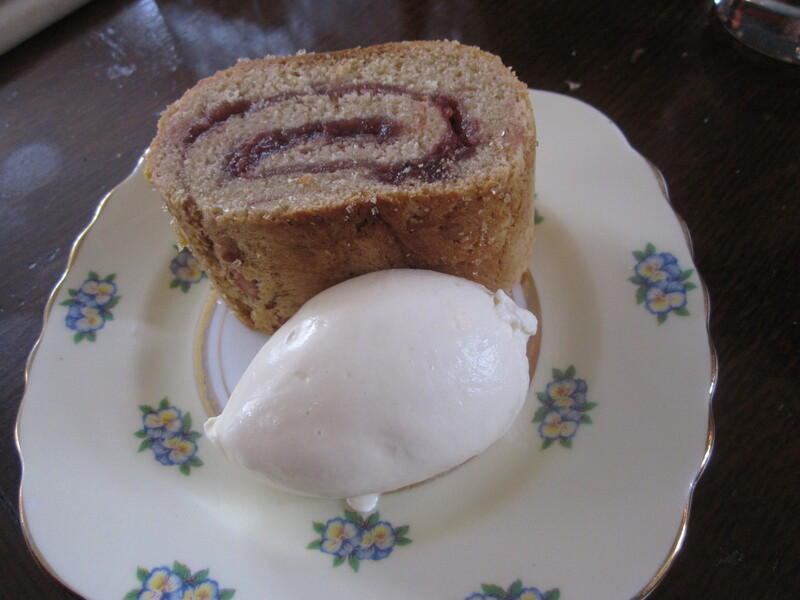 Again a round of cheers when this pudding came to the table – Rolled Jam Pudding. 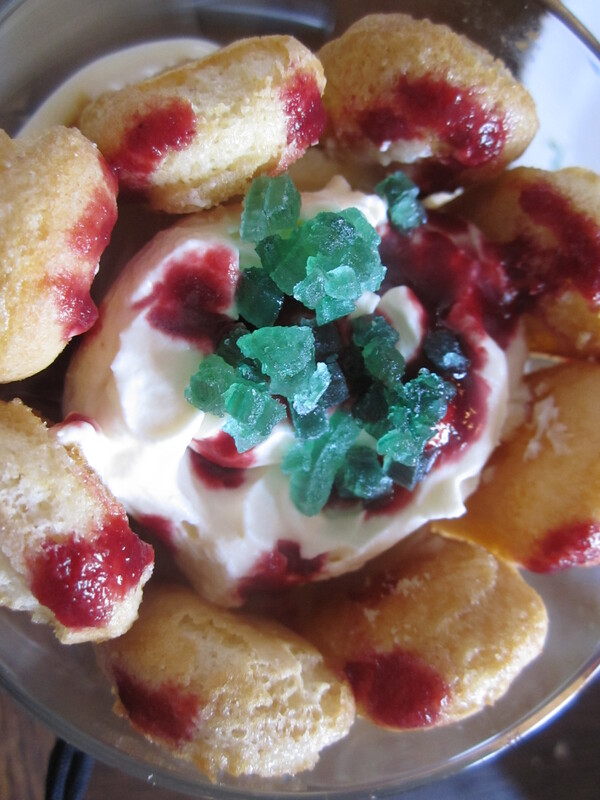 A good level of sugar crunchy of the fluffy pudding. Again I went for the dish no one else had ordered out of curiosity and greed and super happy with my choice of the Charlotte au Russe. Sponge fingers standing proud, with an enriched cream (like a zabaglione) with tart cherries nestled under their blanket of cream and topped with candied angelica. It is fair to say it came in a goblet and was passed around to be savoured by all. We all had such a fantastic time and was great doing something different with a group of friends just appreciating great food. The staff were friendly and attentive to us and hopefully didn’t mind the loud laughter too much. They also introduced the dishes and gave background information about the dishes. A fantastic foodie experience and stress how you should pay this wonderful place for a visit, especially their Sunday Lunch menu which I’ve heard great things about as well. I’m also rounding up my crew already to get booked into the Christmas Feast this year. When you are surrounded by fantastic friends and family with fantastic food, turning another year old doesn’t seem too bad.